Spring Break this year involved a long road trip for my family and me. 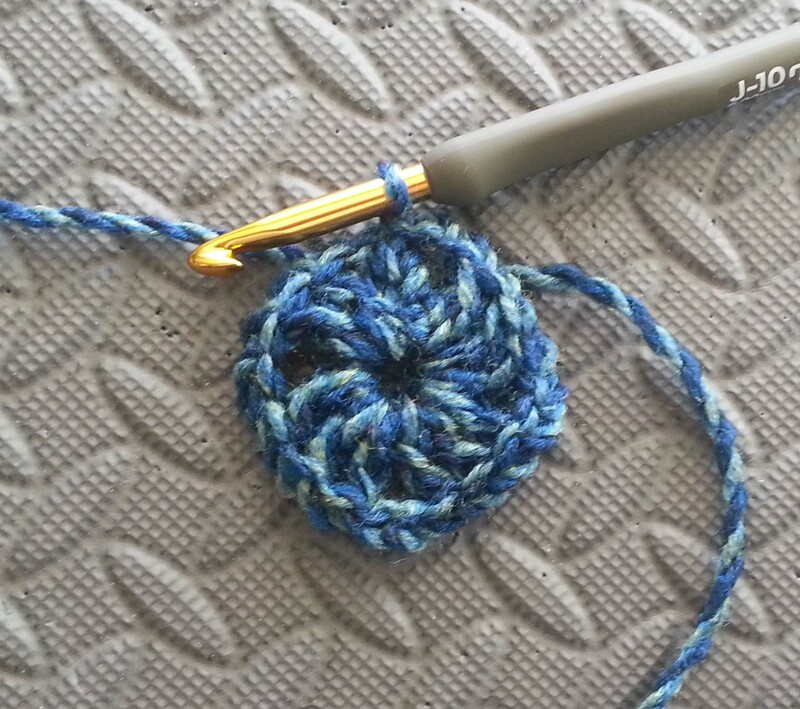 My favorite way to entertain myself on a road-trip is to crochet and listen to music or pod-casts. Makes the miles go along quickly between stops for food, gas and restrooms. We drove from our home in the mountains above Boulder to just outside of Kansas City, Kansas. All together it took us about 13 hours, that included 5 stops to re-fuel the car and kids and allow everyone to stretch their legs (including the dog). I was capping off our week in Kansas City by attending and teaching at the First Annual Fiber Arts Day that following Saturday. 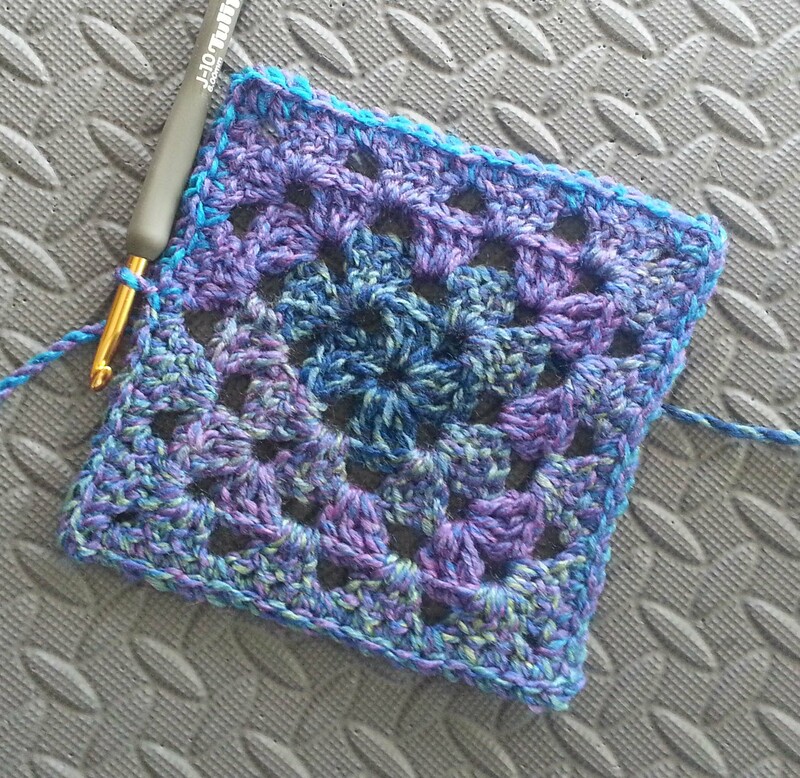 One of the requests for those coming to the event was to contribute at least one 6 inch granny square. So I decided it was time to re-visit this old friend. 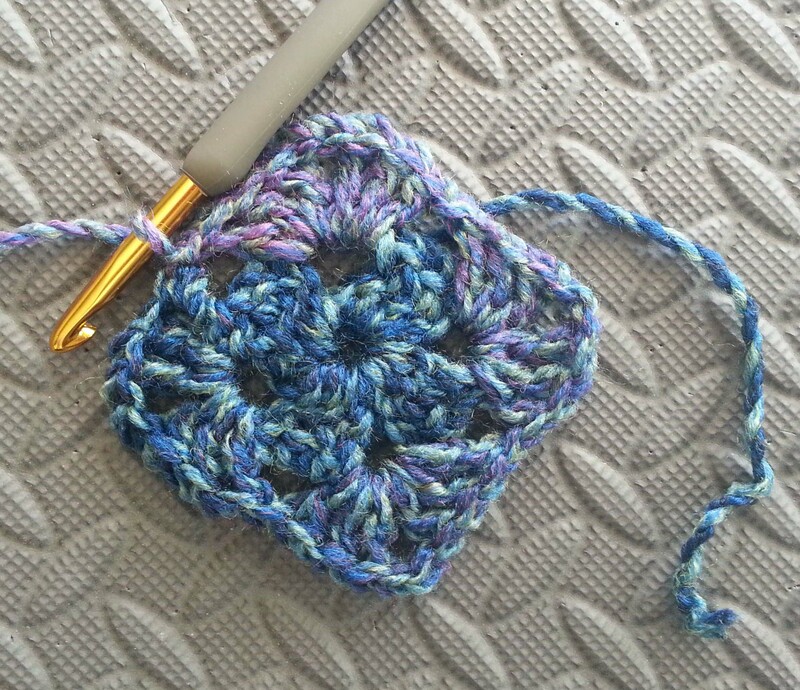 It had been awhile since I last crocheted a granny square and I had to experiment a bit to get one the size I wanted. After I got the hang of it though, I was crocheting up 2 in no time at all. I am a big fan of letting the yarn do the heavy lifting, in this case I got the effect of a granny square worked in multiple colors without the tedium of having to weave in lots of yarn ends. As there are more and more yarns like this, with the long runs of colors changing into the next, you can find something in your nearby shops to use this way. When I use these sorts of yarn, I turn with each round since I am not changing the color, this allows me to work into the next chain space neatly. 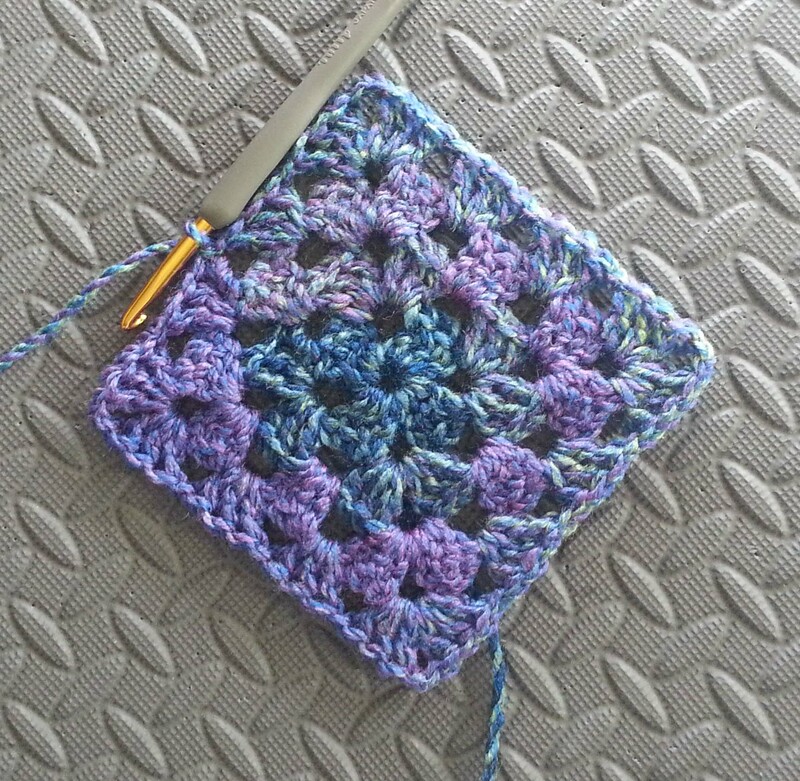 The following is my recipe for my granny squares. I used a size J/6 mm hook with Lion Brand Yarns “Unique” in the picture above, for my samples in the pattern I used Lion Brand Yarns “Tweed Stripes”. It didn’t take as many rounds to complete these squares because these yarns are slightly bulky, 4 rounds were a tiny bit shy of 6 inches though. I ended up putting a single crochet edging round to get the exact size. 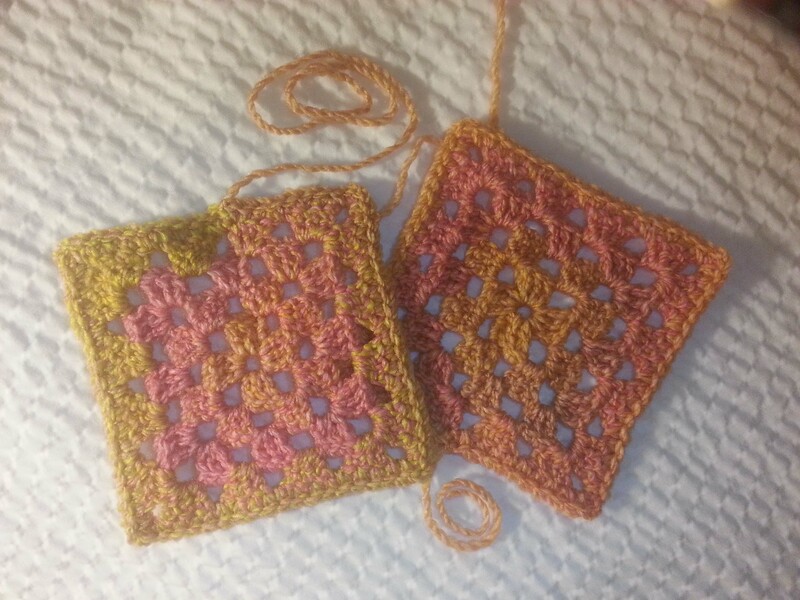 You can use a lighter weight yarn, but you will need to add rounds to the squares and you may not get a 6″ square. Start with an Adjustable slip knot (I use the adjustable slip knot so that the first chain can expand as I make Rnd 1), ch 5, sl st into 5th chain from hook to make a ring. Rnd 1: Ch 3, turn, (2 dc, ch 2, [3dc, ch 2] 3 times) into ring, sl st to 3rd ch of beginning ch-3. Pull gently on beginning tail to snug center opening. Rnd 2: Ch 3, turn, (2 dc, ch 2, 3 dc) in next ch-2 sp, ch 1, [(3 dc, ch 2, 3 dc) in next ch-2 sp, ch 1] 3 times, sl st to 3rd ch of beginning ch-3. Rnd 3: Ch 3, turn, 2 dc in next ch-1 sp, ch 1, [*(3 dc, ch 2, 3 dc) in next ch-2 sp, ch 1*, 3 dc in next ch-1 sp, ch 1] 3 times; Repeat from * to * once, sl st to 3rd ch of beginning ch-3. Rnd 4: Ch 3, turn, 2 dc in next ch-1 sp, ch 1, [*3 dc in next ch-1 sp, ch 1*, repeat from * to * until reach corner ch-2 sp, (3 dc, ch 2, 3 dc) in corner ch-2 sp] 4 times, repeat from * to * until reach end of round, sl st to 3rd ch of beginning ch-3. Rnd 5: Ch 1, turn, [sc in each st and ch-1 sp til reach corner ch-2 sp, (sc, ch 2, sc) in corner ch-2 sp] 4 times, sc in each remaining st and ch-1 sp to end of round. Sl st to first sc of round and fasten off. 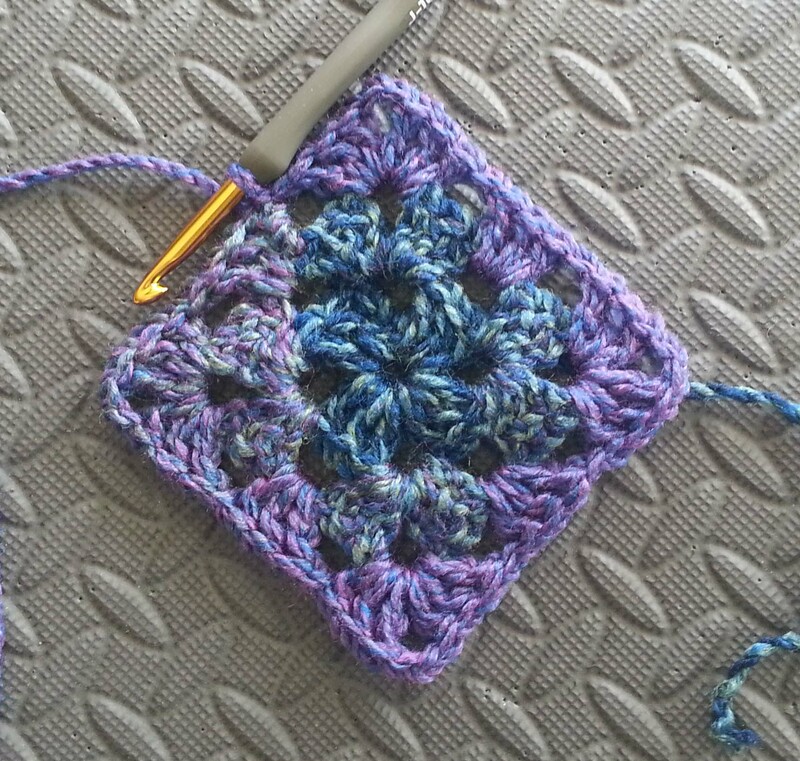 If you want to make your granny square larger, just repeat Rnd 4 until you reach the size you want, then work Rnd 5 to finish. I’ll be working on more of these fun squares during our family road trips this summer. They are a great little project to carry along when traveling because they don’t take a lot of time or yarn and they don’t take a lot of concentration either. Once you get a pile of them finished you can join them together to make a blanket, a scarf, a bag or even a jacket.